Camelina (Camelina sativa (L.) Crantz) is an ancient oil and food crop with current potential for biodiesel production and animal feeding. Camelina is an annual or overwintering herb, which grows to a height of 30-60 cm. The stems are single, usually branched above, glabrous, sometimes with few simple and branched hairs. The leaves are alternate, sessile, lanceolate, entire or slightly toothed, 28 cm long x 20 mm wide, glabrous or sparsely hairy. The inflorescences are elongated racemes borne on ascending pedicels. The flowers are tetramerous, light yellow or greenish-yellow in colour. The pods are leathery, pear-shaped and contain many seeds that are oblong, brown, deeply grooved and 2-3 mm long (Francis et al., 2009). Camelina (Camelina sativa (L.) Crantz) is an ancient oil and food crop that has gained renewed interest for its high n-3 fatty acid content and for its potential for biodiesel production. Camelina is adapted to various climatic conditions, has low nutrient requirements and good resistance to diseases and pests. Due to its extremely high content (about 70%) of polyunsaturated fatty acids (PUFA), camelina seeds and their by-products have considerable industrial potential: food, animal feeds, nutraceuticals, paints, dyes, cosmetics, biofuel, etc. (Rode, 2002). However, in the late 2000s, camelina had undergone little research and its full agronomic and breeding potential was unexplored (Francis et al., 2009). Camelina seeds contain between 36 and 47% oil (Przybylski, 2005). Camelina oil meal, the by-product of camelina oil extraction, is a protein-rich and often oil-rich feed with potential in livestock feeding (Korsrud et al., 1978). Camelina is thought to have originated in south-eastern Europe and south-western Asia. It could have been introduced as a weed in flax and other crops (Knörzer, 1978). Camelina is adapted to cool temperate semi-arid zones on dry prairies or steppes. It is rarely found in Mediterranean or coastal climates, excepted in the North Sea periphery in Europe (Jalas et al., 1996). It is grown in Europe, Canada (Alberta, Saskatchewan, Maritime Provinces) and in the Northern USA, where it is also a prospective possibility for biofuel production (Francis et al., 2009). Camelina is tolerant of dry soils and low rainfall. Because camelina ripens early, it can grow to maturity before frost in regions with a short growing season, for example maturing 21 days earlier than flax (Shukla et al., 2002). Camelina can survive early-season water deficits and minor frosts in spring (Terramax, 2008). In Northern France, winter-sown annual camelina can tolerate temperatures of -10°C to -14°C over a period of several days without snow cover (Bonjean et al., 1999). In the Northern Corn Belt of the USA, autumn-seeded camelina can survive 3 consecutive months below -10°C. 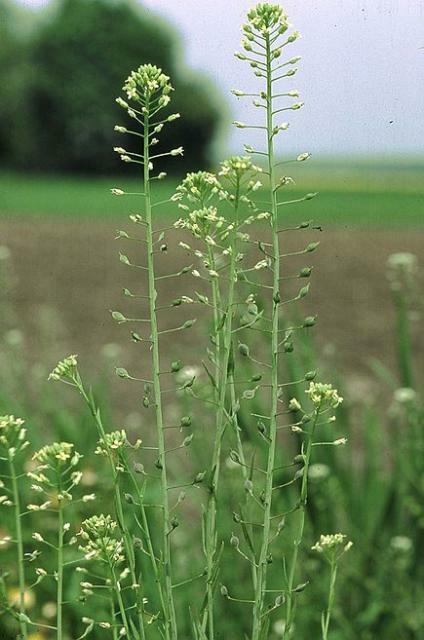 Camelina is a fast-growing plant (85-100 days to maturity) and it can be incorporated into double cropping systems during cool periods in warmer environments (Przybylski, 2005). In Minnesota (upper Corn Belt), winter camelina was harvested early enough to allow the production of a second crop (Gesch et al., 2011). Camelina does well on poor marginal soils provided they are well-drained. For this reason, it compares favourably with other oil crops such as soybean, sunflower or rapeseed, which are not suitable in low moisture, low fertility and saline conditions (Nolte, 2010). Yields of camelina seed are in the 1.5-3.0 t/ha range (Przybylski, 2005). One hectare can yield more than 370 L of oil and 1 t of oil meal (Enjalbert et al., 2011). Both winter and spring annual genotypes exist. In Northern America, annual winter camelina gives optimal yields when sown from early to mid-October (Gesch et al., 2011). 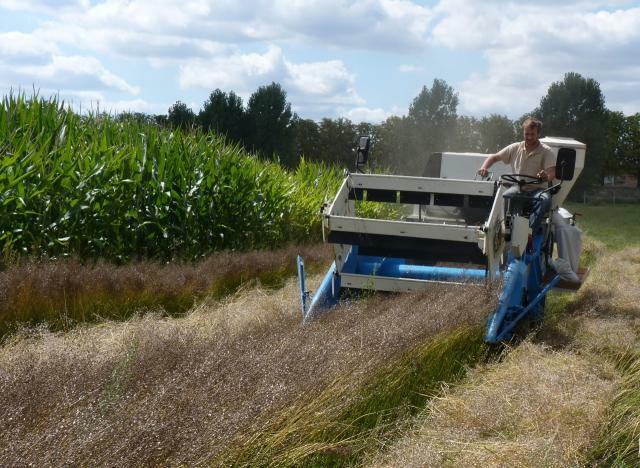 In Europe, annual spring camelina gives better yields when sown in early spring (ITAB, 2009). Camelina is ready for harvest when pods turn yellow brown. The seeds can be directly harvested or swathed in order to limit pod shattering. Harvesting at night also limits pod shattering. Harvest can be done with a combine-harvester. Once harvested, the seeds must be dried to contain 6-7% moisture before storage (Enjalbert et al., 2011). Camelina shows good potential for sustainable agriculture systems. It is often cited in organic agriculture literature because of its compatibility with minimum tillage systems (Przybylski, 2005). It is a valuable winter cover crop (Gesch et al., 2011). The seed gum layer has potential as a corrective to stabilize exposed soils threatened by erosion. The gum layer may also be used to coat other seeds in order to improve their germination in challenging environments (McVay et al., 2008). Unlike rapeseed (Brassica napus) and other mustards, camelina is resistant to blackleg (Leptosphaeria maculans), a major pest of Brassicaceae (Putnam et al., 1993). It has been suggested that interactions between camelina roots and bacteria produce allelopathic substances that may play a role in weed control. These substances could promote the growth of flax radicles thus enhancing flax growth and controlling weeds in camelina-flax or camelina-pea mixtures (Francis et al., 2009; Toncea et al., 2006 cited by Francis et al., 2009; Saucke et al., 2006; Lovett et al., 1981). Although no longer the case in North America, in Europe Camelina species are frequently present as weeds or intercropped with flax (Francis et al., 2009). In Central Europe, Camelina sativa is used in seed mixtures for wildflower strips introduced to increase biodiversity in intensively used arable land (Kollmann et al., 2001). Genetically modified Camelina sativa is being developed in order to produce camelina seeds that accumulate omega-3 long chain PUFA. In the UK, permission was granted to carry out a GM field trial in 2014-2017 (Rothamsted Research, 2014). Camelina oil meal has a relatively high protein content (about 31-41% DM) as well as high but variable amounts of residual oil (5 to 26% DM) depending on the efficiency of oil extraction. It is, therefore, a potential source of protein and energy for livestock. Another benefit of camelina oil meal is the high content of the oil in PUFA, and notably in omega-3 fatty acids such as α-linolenic acid, and in γ-tocopherol, an antioxidant vitamin (Cherian, 2012). However, camelina oil meal contains significant amounts of fibre (crude fibre 8-18% DM) and various antinutritional factors (see Potential constraints below) which affect its suitability for livestock, particularly pigs and poultry. Camelina seeds and their by-products contain antinutritional factors that limit their use in animal feeds (Matthäus, 1997; Lardy et al., 1994). 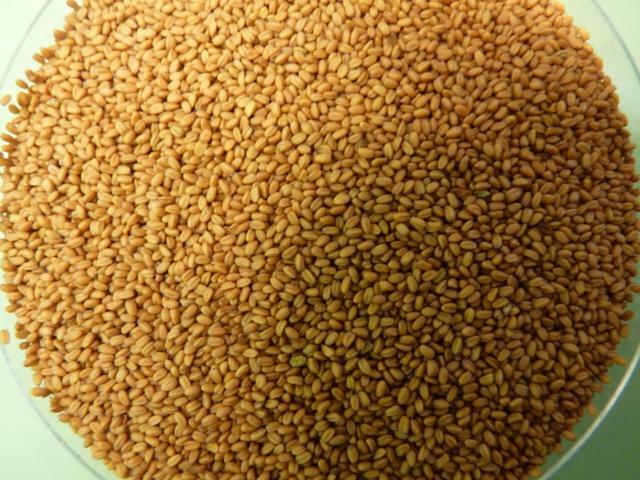 Like other plants of the Brassicaceae family, camelina seeds contain glucosinolates, which induce a lower activity of the thyroid gland and cause metabolism disturbances. Camelina oil meal contains about 20-30 µmol/g glucosinolate, which is much lower than in crambe or mustard oil meals (more than 100 µmol/g), but higher than in low glucosinolate rapeseed meals (canola or "00"). Camelina seeds contain no progoitrin that forms the toxic goitrin (Matthäus, 1997). Camelina products are, therefore, of moderate toxicity with regards to their glucosinolate content (Lange et al., 1995; Matthäus, 1997). Camelina seeds contain sinapine, an alkaloid that causes a fishy taint in eggs. However, camelina oil meal was found to contain lower amounts of sinapine (2-4 mg/kg) than mustard or rapeseed oil meal (Matthäus, 1997). Camelina oil contains 2-5% erucic acid (22:1n-9), which is higher than in food-grade rapeseed oil (canola or "00") but much lower than in high-erucic rapeseed oil (more than 50%). In the 1970s, erucic acid was found to induce myocardial lipidosis in rats, and was regulated to a maximum of 2% (USA) or 5% (EU) in the fat portion of food products (with special regulations for infant foods) (Putnam et al., 1993; Kramer et al., 1990). Camelina oil meal and camelina seeds are valuable sources of protein and energy for ruminants (Cais-Sokolinska et al., 2011; Moloney et al., 1998). They can be used to improve the fatty acid profile of milk and meat (Cieslak et al., 2013a; Cais-Sokolinska et al., 2011; Mierlita et al., 2011; Mihhejev et al., 2007). There is little information on the digestibility of camelina oil meal but its nutritive value is likely to be quite good due to the high protein and oil content. Indeed, one study found relatively high in vivo OM and protein digestibilities of 72% and 77% respectively, close to those of maize gluten meal and sunflower meal (Moloney et al., 1998). In lactating dairy cows, a camelina oil meal-based diet rich in linoleic acid resulted in the greatest increase in conjugated linoleic acids in cheese, but in a lower overall quality score (taste, flavour, texture, colour, appearance and consistency) when compared to cheese from cows fed on linseed meal, soybean meal or rapeseed meal (Mihhejev et al., 2007). In crossbred (Angus x Gelbvieh) yearling heifers, camelina oil meal had no effect on body weight and blood metabolites (except an increase in triiodothyronine). It had a positive effect on first-service pregnancy rates, thus decreasing the cost per pregnancy. Camelina oil meal was considered as a suitable substitute for maize and soybean meal for growing heifers (Moriel et al., 2011). In dairy ewes, camelina oil meal included at 3 or 5% increased PUFA in milk, particularly monounsaturated and n-3 PUFA. The milk had lower atherogenic and thrombogenic indices, mainly due to a lower content of saturated fatty acids (Szumacher-Strabel et al., 2011). Milk from ewes supplemented with 10 or 20% camelina oil seed meal had higher content of volatiles (primarily fatty acids) and distinct animal, grainy and processed aromatics, but the dairy aroma was considerably reduced. After pasteurization, the content of volatiles was further increased (Cais-Sokolinska et al., 2011). In lambs, camelina oil meal included at 10 or 20% of the diet modified the fatty acid profile of the longissimus dorsi muscle, resulting in a higher content of nutritionally desirable fatty acids, including 18:2 cis-9 trans-11, 18:2 trans-10 cis-12, 18:1 trans-11, 20:4n-6, 20:5n-3 (EPA) and 22:5 (Cieslak et al., 2013a). In dairy cows, a comparison of raw, moist-heated or dry heated camelina seeds showed that moist heat was the most efficient treatment to decrease rumen-degradable protein, thereby increasing the intestinal digestibility of rumen-undegradable protein (Peng QangHui et al., 2014). In grazing dairy ewes, supplementation with camelina seeds had no effect on milk yield or milk protein content but it increased energy-corrected milk, milk fat content and milk fat yield, and enhanced the fatty acid profile with beneficial PUFA (C 18:1 trans-11, C 18:3 cis-9 trans-11 CLA) (Mierlita et al., 2011). Studies on the use of camelina oil meal in pigs have been negative, probably due to the presence of antinutritional factors, a relatively high level of fibre and the low level of lysine compared to soybean or rapeseed meal. Inclusion of camelina oil meal above 5% resulted in depressed growth rate, lower meat palatability, lower fat consistency (Böhme et al., 1997), as well as in a decrease in the induction time of fat development and a loss of vitamin E (Flachowsky et al., 1997). On the positive side, OM and protein digestibilities (71 and 79%, respectively, Böhme et al., 1997) and standardised ileal amino acid digestibilities of camelina oil meal were similar to those of rapeseed meal (Almeida et al., 2013). An ME value of 13.9 MJ/kg DM was proposed (Böhme et al., 1997). Standardised ileal amino acid digestibilities of camelina seeds were lower than those of rapeseed meal (Almeida et al., 2013). Camelina oil meal has a high protein and oil content, but, due to its high fibre content and the presence of antinutritional factors and non-starch polysaccharides, it has a low digestibility and a low ME/GE ratio in poultry (Acamovic et al., 1999). The inclusion of camelina oil meal up to 15% depressed feed intake, weight gain and feed conversion in most studies (Aronen et al., 2009; Pekel et al., 2009; Ryhanen et al., 2007; Thacker et al., 2012), except one, where the inclusion of camelina oil meal at 5 or 10% over 6 weeks had no effect on body weight gain, carcass weight and feed efficiency (Aziza et al., 2010b). The addition of copper to a camelina oil meal-based diet (10%) improved body weight gain and carcass characteristics (Pekel et al., 2009). Feeding camelina oil meal was reported to decrease mortality in broilers (Aronen et al., 2009). Broilers fed camelina oil meal had no lesions in livers, and the activity of the thyroid gland remained unchanged (Ryhanen et al., 2007). Due to its high oil and PUFA content, camelina oil meal has valuable effects on broiler meat characteristics (Cherian, 2012). It can be used to improve the fatty acid profile of poultry meat by increasing the percentage of α-linolenic acid and longer n-3 fatty acids, such as 20:5n-3, 22:5n-3 and 22:6n-3, and decreasing the n-6/n-3 ratio (Cherian, 2012; Thacker et al., 2012; Aziza et al., 2010a; Aronen et al., 2009). Feeding broilers with camelina oil meal had no effect on the sensory quality of meat. It inhibited lipid oxidation and enhanced antioxidant capacity in meat (mainly thigh) during short or long term storage and during cooking (Aronen et al., 2009; Aziza et al., 2010b). Meat from female broilers fed 5% camelina oil meal was significantly more tender than meat produced by feeding 10% camelina oil meal (Ryhanen et al., 2007). Camelina seeds included at 10% of the diet (DM basis) for organically produced broilers as a replacement for full-fat soybeans decreased final live-weight and carcass fat, but had no effect on animal survival (Ciurescu et al., 2007). Extruded camelina seeds included at 5 or 10% in broiler diets did not impair performance (live weight, feed utilization and carcass quality) (Jaskiewicz et al., 2003). Camelina oil meal could be included only to a maximum of 5% in the diets of turkey poults with positive economic results. However, camelina oil replaced other vegetable oils without hampering weight gain and feed conversion ratio (Frame et al., 2007). 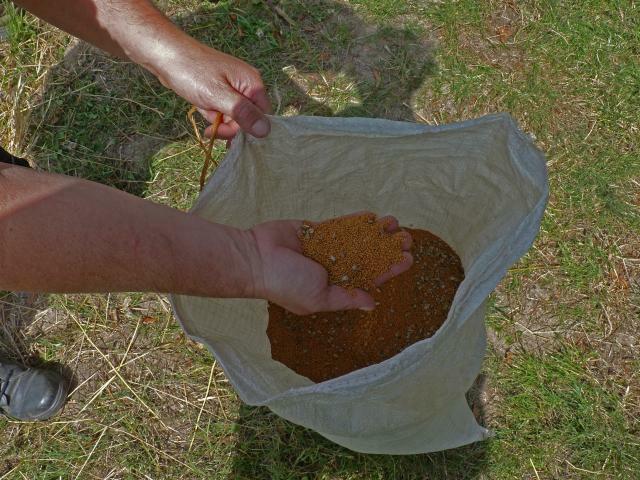 Adding camelina oil meal to diets for laying hens gave inconsistent results. It slightly reduced feed intake with no effect on egg production and feed conversion ratio in some trials, but in others it resulted in lower egg production, lower yolk weight and lower total fat content in the eggs (Aronen et al., 2009; Cherian et al., 2009; Valkonen et al., 2006). The effect of including camelina oil meal on the quality and fatty acid profile of eggs is generally positive. Increasing camelina oil meal in layer diets resulted in higher concentrations of n-3 fatty acids in the yolk and a decrease in the n-6/n-3 ratio (Cherian, 2012; Aronen et al., 2009; Cherian et al., 2009). For example n-3 fatty acids were 8-fold, 8.5-fold and 9-fold at 5%, 10% and 15% camelina oil meal, respectively, compared with the control diet. An 8-fold increase in 22:6n-3 (DHA) was observed at 15% camelina oil meal inclusion when compared with the control. The n-6/n-3 ratios were significantly reduced from 14.8 with the control diet to 5.6, 4.6 and 4.3 at 5%, 10% and 15% inclusion of camelina oil meal, respectively, which are desirable ratios for human health (Cherian et al., 2009; Valkonen et al., 2006). No systematic effect on sensory quality of eggs were observed in 2 out of 3 experiments (Aronen et al., 2009; Valkonen et al., 2006). However, camelina oil meal may negatively affect the quality of egg lipids (higher oxidization) when included above 10% (Cherian et al., 2009). Camelina seeds and camelina oil meal have been used safely in fattening rabbit diets as sources of protein and energy (Hrastar et al., 2012). Camelina seeds could be included at up to 15% (the highest tested level) in balanced diets without affecting live weight, live weight gain, feed consumption, feed efficiency, carcass yield, or the percentages of edible parts (Peiretti et al., 2007b). The high proportion of α-linolenic acid in camelina oil is advantageous both for rabbit health (Colin et al., 2012) and meat quality (Peiretti, 2012). Due to the high content in γ-tocopherol, a very active antioxidant, in camelina seeds (Hrastar et al., 2012), inclusion up to 15% camelina seeds did not alter the oxidative status of rabbit meat (Prola et al., 2011). Camelina oil and camelina oil meal are potential substitutes for fish oil and fish meal in aquaculture feeds. However, research on camelina products in aquaculture is relatively new and further research is needed to determine their suitability. In rainbow trout, digestibilities of DM, energy and protein were respectively 38, 44 and 72% for camelina oil meal and 36, 32 and 66% for camelina seeds. Heated camelina oil meal (115°C for 20 minutes) fed to rainbow trout (450 g) for 12 weeks was included at up to 10% of the diet without hampering growth rate (McCuaig et al., 2009). Jalas, J. ; Suominen, J. ; Lampinen, R., 1996. Atlas Florae Europaeae Distribution of vascular plants in Europe. Vol. 11 (Cruciferae: Ricotia to Raphanus). Helsinki University Printing House, Helsinki, Finland. 310 pp.